Our Christmas Tree Decorating Tradition is a bit chaotic, but so much fun! We enjoy a family dinner together, then gather in the living room with all of our decorating supplies. We set aside a few hours to complete the task, then get to work while listening to Christmas music! Grant is always in charge of unwrapping each ornament and handing them out one by one to be hung on the tree by the kids (or me), while I take the pictures and help as needed. Each of our children have special ornaments of their own. They love rediscovering favorite ornaments they received in the past, and finding the perfect spot on the tree to display them! All of our kids love our Christmas Tree Decorating Tradition, but as you can see, some are more enthusiastic than others! Just kidding....this is more like it! I absolutely love watching our kids work together to decorate the tree, and seeing the joy on their faces when they spot a favorite ornament that they forgot about! This year, we even had an extra supervisor! The last ornament(s) we always hang up are the pickles! Maybe you already know about the pickle tradition, but it has been a tradition in my family since I was a child. My dad's family is German, and apparently it's an old German tradition to hide a ceramic pickle ornament in the Christmas Tree. Whoever finds it ends up with an extra gift! We somehow ended up with two pickle ornaments! We have the kids leave the room, then Grant hides them in the tree. They always race back in to search! This year, Lily found both pickles! This year, Lexie got to put the star on the tree! I don't have a "finished" picture of the tree just yet, because it's now over a week later, and I still have to add the ribbon. Perhaps that will be my project tomorrow! It definitely looks beautiful, though! We had a great time kicking off the Christmas season! 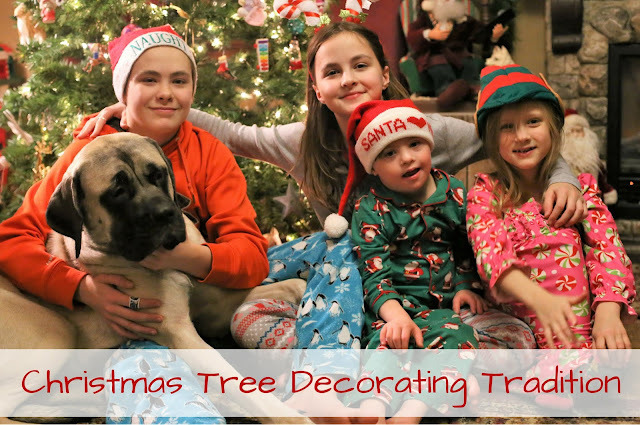 The kids had fun working together to decorate our Family Christmas Tree, and shared a lot of laughs along the way. It was a memorable night, and our beautiful Christmas Tree is now full of memorable ornaments! 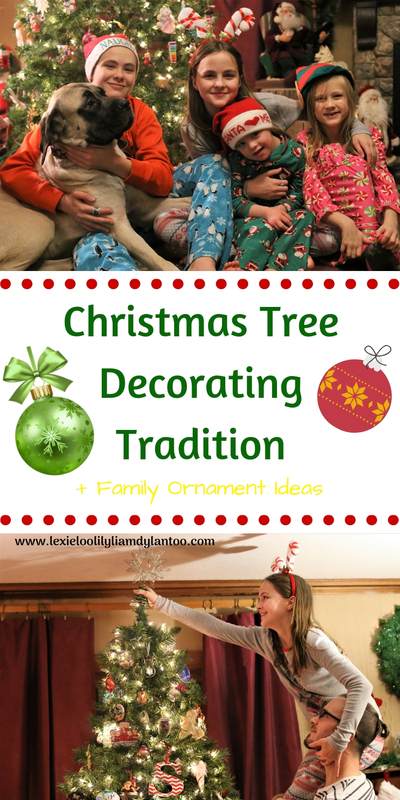 Have a Christmas Tree Decorating night each year with your family to officially start the holiday season. Have a family dinner, enjoy special treats, put on Christmas music, and just have fun! Choose a special family ornament each year to hang on your tree. Buy an ornament from the places you travel to each year to hang on your tree. Buy each child a special ornament each year that perfectly represents them or their year. When they are grown up, you can give them a box of special ornaments for their own Christmas Tree! Start a "German Christmas Pickle" ornament traditions. Let your kids take turns each year hanging the star on the tree! So sweet. I love your traditions! I love the candid sibling pictures too. Decorating the Christmas tree is definitely chaotic! I'm always running behind Jacob and Olivia making sure they're not breaking anything. Haha. You got some great shots, though! You will treasure these pictures one day! Beautiful tree and such lovely photos!!! Aw, what a great tradition. I've never done the German pickle ornament, but I do know what it is - I like that your kids enjoy finding it, and go Lily for finding both this year!